Long-sleeved, button-down shirts of varying lengths but all long. Some have princess seaming which shows more body shape, and some are cut straight down which completely hides body shape. 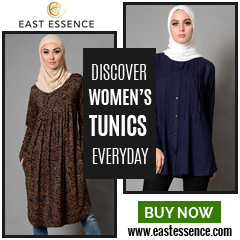 Long-sleeved, pullover tunics and blouses of varying lengths. This category does NOT include the Pakistani-Indian kurti. There is a separate category for those on this page. Long and short knitwear. Some open in the front (cardigans) and some pull over the head. Pakistani-Indian tunics. Some are embellished, some are plain. Some are slightly see-through requiring an undergarment. Some are shorter, some are longer.